One thing that inspires many pinhole photographers is the craft of building their own cameras. Finding new materials or a perfect box can be like uncovering a hidden treasure. The pinhole camera is amazing in its simplicity. It is, in its most basic form, a light proof container with light sensitive material at one end and a pinhole at the other. Pinhole cameras are characterized by the fact that they do not have a lens. If a camera has a lens, it is NOT a pinhole camera. When the shutter is opened, light shines through to imprint an image on photographic paper or film placed at the back of the camera. 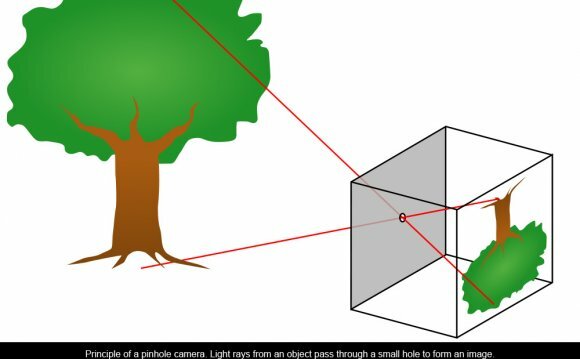 Pinhole cameras rely on the fact that light travels in straight lines – a principle called the rectilinear theory of light. This makes the image appear upside down in the camera. If the dimensions of your camera and the size of your pinhole are correct you can take a photograph that will compete on a technical level with a photograph from your digital SLR camera. A small pinhole generally produces sharper images than a larger one. However, if the pinhole is too small, light waves may be scattered slightly at the edges of the pinhole and cause distortion or loss of focus. Smaller holes also increase exposure times, since they will let less light into the camera. The focal length of your pinhole camera is the distance between the pinhole at the front of the camera and the paper or film at the back of the camera. When the light enters the pinhole at the front of the camera, it is projected onto the paper or film at the back in a circle. The diameter of the image circle is roughly three and a half times the focal length. You may end up with a black vignette around the image if you have a shorter focal length. And this may be exactly what you want. The vignette appears because light is forced to travel further to the outer edges of the circle leaving it underexposed. If you don’t want this effect, make sure the camera doesn’t require paper that is larger than approximately twice its focal length. A camera with a focal length of 3 inches will produce an image with a diameter of approximately 10.5 inches. The intensity of the light in your camera decreases as you extend the length of the camera. The light will be stronger nearest the hole and gradually weaken as it continues towards the back of the camera. This means that you will need longer exposure times for telephoto cameras. The quick and easy way to learn how to build a pinhole camera! From pinhole to print will guide you from drilling your first pinhole to printing your first pinhole photograph. It is an easy to read, step-by-step guide to making a pinhole camera and creating images.